India Profile takes you on a journey to one of the most popular wildlife sanctuaries at Ranthambhore that makes up for an elating experience especially if you are lucky enough to sight the Big Cat, Tiger. Ranthambore was among one of the very first sanctuaries to come under the protection of the Project Tiger. This national park is situated near the Ranthambore fort in a rich forest area littered with ruins that date back to the 10th century. The areas in and around the Park offer beautiful lakes frequented by a wide range of wildlife. Here you can enjoy the rolling grasslands, rushing streams, open scrubs, heavily wooded valleys and through deep ravines walled on either side with steep cliffs. The deciduous forests of Ranthambore were once part of the magnificent jungles of Central India. The terrain is rugged and there are rocky ridges, hills and open valleys with lakes and pools. The Ranthambore national park is set between the Aravalli and Vindhya ranges, the total area of the national park stands at 1,334 sq km. The Ranthambhore Park is a great place for adventurous jungle safaris. On your way to the Ranthambore sanctuary you can see the green wheat fields and the mustard fields of Rajasthan with the ruins of old forts set atop hillocks surrounded by the yellow haze of mustard. A ride on the Tonga would add more fun to your journey. tigers you can see antelopes like, Nilgai, Sambhar and Chital, which are easy to spot. Those who are lucky enough get to see the Sloth Bear, Wild Boar, Chinkara, Porcupines and Jackals, Leopard, Jungle Cat and Marsh Crocodile. The lakes and water holes in the Ranthambore national park are the best places to sight the animals. The main attraction of the national park is the old Ranthambore Fort, which sits on a rocky outcrop in the heart of the Park. The fort dates back to the 10th century and is probably the oldest existing fort in Rajasthan, was a vital citadel for control of Central India and particularly the Malwa plateau. The entry point to the Ranthambore National Park goes straight to the foot of the fort and the forest rest house, Jogi Mahal. The latter boasts of the second-largest Banyan tree in India fort of Ranthambhore set on a hill and brooking over the sanctuary. It was the massive stronghold of the Rajput King Hamir who was defeated by Allauddin Khilji's army in 1301 AD. A glorious era in the history of Ranthambhore was, when Emperor Akbar invested it in 1569. In 1955 Ranthambhore became a sanctuary and was one of the very first protected areas. Getting There: Jaipur at 145-kms is the nearest airport from Ranthambore wildlife sanctuary. 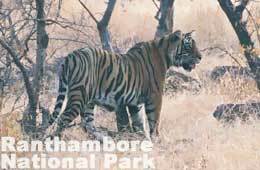 Ranthambore National Park is around 11-kms away from Sawai Madhopur railway station that lies on the Delhi to Bombay trunk route. A good network of buses connect Sawai Madhopur, the nearest town from Ranthambore to all the major cities within the state of Rajasthan. Accommodation: There are many accommodation options available at Ranthambore. There are many wildlife resorts near Ranthambore, which offer accommodation ranging from comfortable rooms to luxury tents. 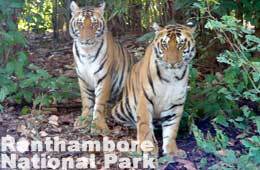 Climate: The best time to visit the Ranthambore national park is during the months of October - March and April to June.